My nine-year search for the perfect 30″ x 60″ table resulted in a recent DIY project. Our kitchen eating area is a long, narrow banquette. I have never loved it. We jammed a table in there when we moved into the house, but its never worked. The table is too long (72″), the legs get in the way, its hard to maneuver around it to sit down, bulky. You get the drift. Since I wasn’t in the mood to reconfigure the entire eating area in the form of a construction project, it was time to change the table. 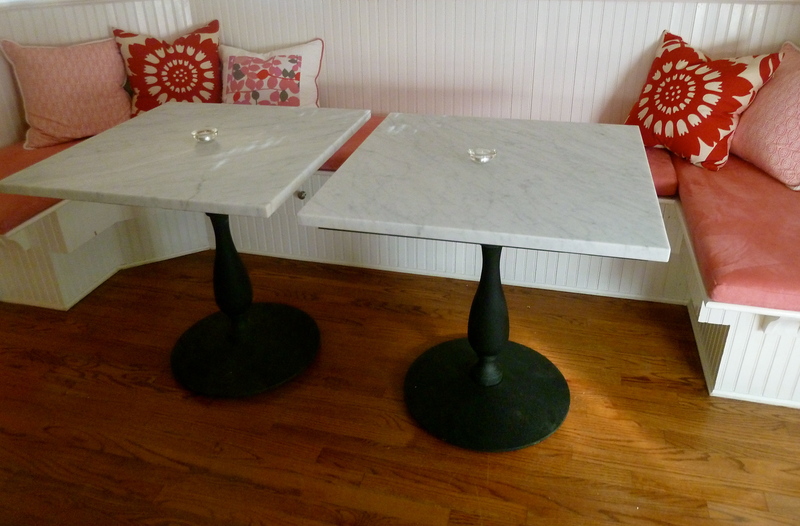 I really wanted a light marble table to brighten up that section of the kitchen, so I got two 30″ x 30″ pieces of Carerra Marble cut at our local Rye Marble. Many stone places have remnant pieces that can be cut to the size you want too. I found two great pedestal bases (so legs won’t get in the way) at Tablebases.com. This is the Savile-20 medium weight, strong enough to hold up the marble top. I needed two pieces of 3/4″ plywood to glue to the bottom of each marble piece. It helps support the table and gives you something to screw the base into. I had two 27″ x 27″ pieces cut at Home Depot. You can go smaller if you want. You have to paint the plywood black so it is the same color as the base. I used Rust-oleum 2x Ultra Cover spray paint. To attach the plywood to the marble, use liquid nails. Spray paint one side and the edges of the plywood black. Mark the bottom of the marble piece where the plywood will be glued on. Once you glue the plywood, it needs to sit for about two days with heavy objects on top before it is ready for the base. While we were waiting for the glue to set, we assembled the two bases and put them aside. Getting excited…. We waited three days to attach the base just to be sure liquid nails did its job. Put the marble piece on the floor (ours is sitting on an old piece of styrofoam). Mark the center on the plywood so you know where to screw in the base. Use #10 Pan Head phillips screws and a drill to attach the base. You need eight screws per base. Our bases came with levelers that screw into the bottom. Helps balance the table. The big reveal! At a certain angle, you can definitely see the black plywood underneath. You can use a smaller piece, I was just nervous the heavy marble wouldn’t be supported enough if I went smaller. I love how open the banquette area looks now and the contrast of the square table top with the round base. We sit here all the time now. Our own private bistro! What a sophisticated DIY project! Form and function, I love it! Love it, well done! Will be over for camembert, baguette and Sancerre ASAP. You’re on! Another drama mama night! Loved reading the blog as much as seeing the finished (gorgeous) project! –A great end to nine years! So good! Well done you! Like a Paris bistro! Our own little Parisian Bistro!